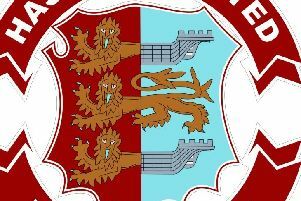 Hastings United Football Club manager Chris Agutter is expecting today’s (Saturday’s) opponents to ‘try and bully us’. Hastings will travel to Three Bridges in the Bostik League South East Division buoyed by last weekend’s thrilling 3-2 victory at home to leaders Cray Wanderers. Agutter said: “Three Bridges are very different to Cray. It was just nice against Cray where you can prepare for what I see as a proper game of football between two footballing sides that want to get the ball down and play. “The preparations to meet that challenge are very different to nine times out of 10 every other team in the league. “Saturday will be a case of going back to the norm in terms of what we need to deal with. They will try and bully us, and get under our skin, be very physical and aggressive, just try and get in our faces really. “If they want to have a football match, I think they know they will lose, to be quite blunt. They will probably try to make it their type of game and our challenge will be to try and deal with that. “I think whenever I’ve faced a Three Bridges side you know it’s never an easy ride and I’m pretty sure the referee will be quite busy. Agutter should have a full squad to pick from with the exception of midfielder Hassan Ibrahiym, who was due to return to training on Thursday night following injury, ahead of schedule. Leading scorer Daniel Ajakaiye missed the Cray match for family reasons, but will return to the squad after netting five times for the development squad on Monday night. Bradley Stevenson and Jack Tucker, whose loan deals from Gillingham were announced yesterday evening, will go straight into the squad. “It’s nice that we’re in the situation we are compared to a few weeks back when we were bare bones,” continued Agutter. “Everyone seems to be back and fit or getting back to full fitness. Hastings are fourth in the table - two points behind second-placed Horsham - with six matches remaining. “Everyone’s very happy,” added Agutter, who hopes to finish the season with an average of two points per game. “It’s just a case of more of the same, and just making sure that we don’t get carried away with the Cray win because it will be a very different type of game this weekend. Bostik League South East Division top half (played-points): 1 Cray Wanderers 29-71 (+40 goal difference), 2 Horsham 30-58 (+22), 3 Ashford United 29-57 (+32), 4 HASTINGS UNITED 30-56 (+23), 5 Haywards Heath Town 29-55 (+19), 6 Hythe Town 30-44 (+7), 7 VCD Athletic 29-44 (-1), 8 Whyteleafe 29-41 (+8), 9 Phoenix Sports 29-39 (-3), 10 Ramsgate 30-37 (+2).